Dear visitors, we have not time to translate into English all real estate which uploading on a website. Therefore we recommend to you to come for the Ukrainian version of a site. On the Ukrainian version of a website you will find much more real estate. We hope for your understanding. a land plot 5000 sq.m. Dear visitors, we have not time to translate into English all real estate which uploading on a website. Therefore we recommend to you to come for the Ukrainian version of a site. On the Ukrainian version of a website you will find much more real estate (property). We hope for your understanding. a land plot 8471 sq.m. Clean waters of the mountain rivers, mountain-skiing slopes, mountain lakes, foot routes, rafting, mountbike - all this involves thousand people which search rest in a combination with the nature. Our information will interest first of all such potential investors who are ready to enclose money in the development of Ivano-Frankivsk region - Mecca of Ukrainian Carpathian mountains. We want to interest you in prospect of the big inflow of tourists where you can become the first in development of new resort zones and the subsequent development of this region.The main part of ours is the non-pollution and practically undeveloped region. Besides it is interesting to those who want to invest favourably in the capital of our property with the further opportunity of resale. 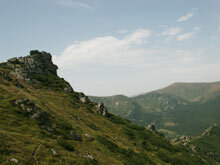 In the near future Carpathian mountains will become a favourite and perfectly sold "brand". Property Agency "Santa" [Sale a property in Carpathian mountains without intermediaries]: land plots, houses, ready business, tourist complexes, commercial property in Kosiv, Verhovyna, Yaremcha, Bukovel, Skole, Uzhgorod, Kolomuya, Palanytsya, Ukrainian, in ukraine, bulgarian property, tourizm, rest, hotels, restaurants, investment projects, sectional houses.